This recipe combines two Pinoy favourites: lumpia and adobo. 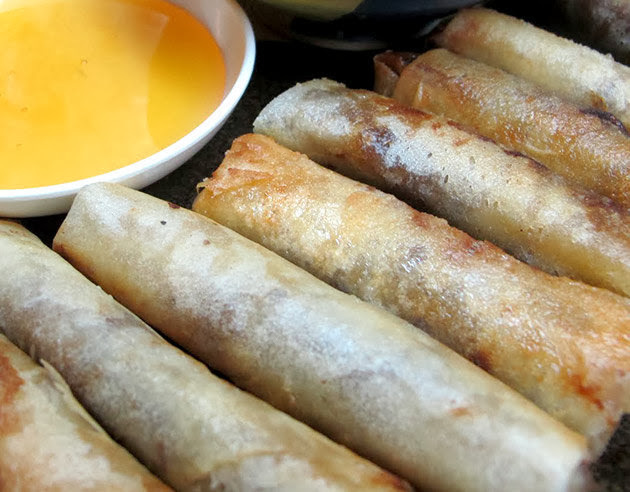 Pinoys love lumpia because of the burst of flavors that comes from just one bite into a neatly packed roll. And adobo...we don’t even have to justify this one. Its distinct Pinoy taste is unmatched in any culture. If there were a National viand, it would probably be Adobo. So putting lumpia and adobo together in one appetizing dish makes a lot of sense, not to mention, packs a lot of flavor. It’s great for potluck parties or after-school merienda for the kids. 1. Put all ingredients, except for the brie, honey, and, of course, the lumpia wrapper, in a big cooking pot. Do not stir. 3. Simmer for 4 hours on low heat or until the chicken meat is falling off the bone. Shred chicken. 4. At this point, you can store chicken in the fridge overnight if you’re using it the next day or you can go straight to the next step. 5. Add shredded chicken to lumpia wrapper and add a sliver of brie. Wrap as you would a regular cheese stick and set aside. Repeat until you finish all the chicken and brie. 6. Deep fry until wrapper is golden brown and brie is melted. 7. Serve with honey and adobo sauce as dipping sauces.